Junior doctors went on strike for the third time in three months on Wednesday to protest against government proposals to change the terms of their contracts, as public support for their industrial action showed no sign of flagging. The 48-hour walkout represents an escalation of the bitter dispute between the British Medical Association, the union representing aggrieved doctors, and health secretary, Jeremy Hunt, who has thus far failed to forge an agreement on the changes. Previous strikes lasted 24 hours but the increase does not seem to have dented public sympathy for the medics. Many of the 147 BMA-backed picket lines outside hospitals were inundated with support from patients, passing motorists, pedestrians and members of other unions. A poll for the BBC showed that 65% support the industrial action, almost identical to the backing before the previous strike last month. In a further boost for the BMA, the percentage against the strike has dropped from 22% last month to 17%. While Hunt, whose imposition of the new junior doctors contract after last month’s walkout raised the stakes, remained conspicuously quiet, many strikers were out winning friends. 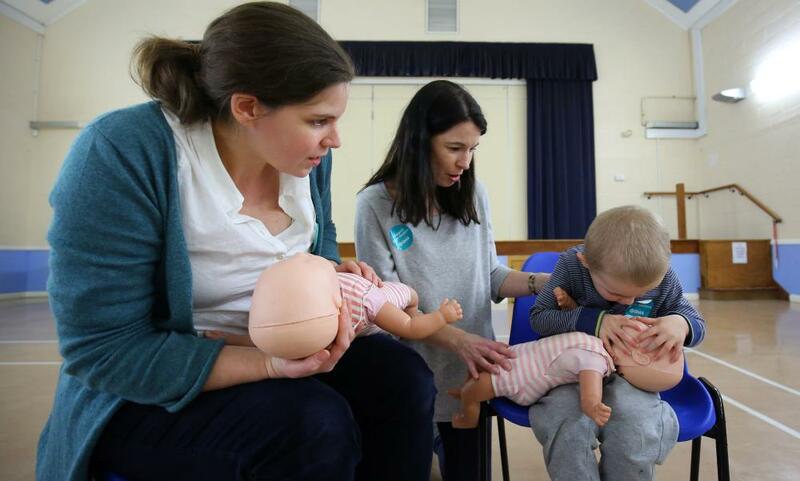 There were around 25 “little life-saver” events, free sessions run by striking doctors for parents to learn first aid skills that could save their children’s lives. Others ran CPR classes, gave blood or took part in “meet the doctors” events, explaining to the public the reasons for the industrial action. Dr Dagan Lonsdale, an intensive care registrar, took part in one of the first aid events at a pub near St George’s hospital in Tooting, south London. “The idea is to just do something positive on the day of industrial action because junior doctors aren’t people for standing around braziers on a picket line, and people feel they want to do something positive and show that this is not about striking for money,” he said. Outside the Royal London hospital in Whitechapel, in the East End, where junior doctors received beeps of support from cars, delivery trucks and buses, even a disgruntled man on crutches, upset that he hadn’t been told his clinic had been cancelled, offered his backing and took a BMA sticker. 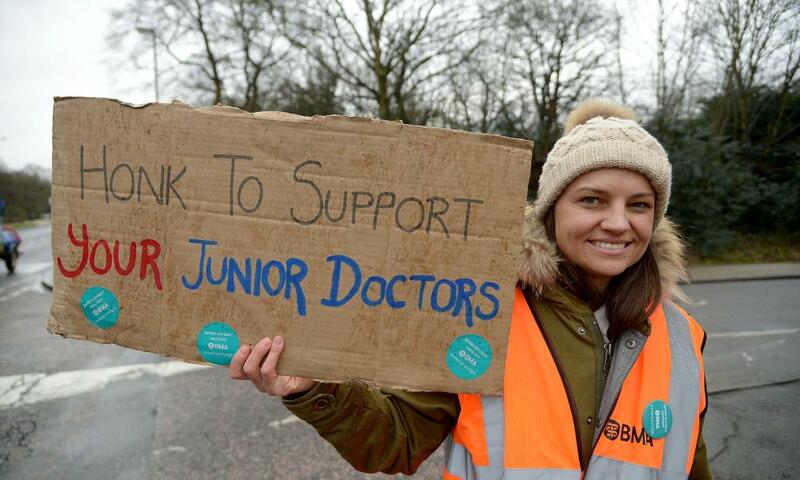 Dr Heather Ryan, 29, a GP registrar who works in a surgery in south Liverpool and joined the picket line outside the Royal University Liverpool hospital, said: “Lots of car horns have been going – it is obvious that the public are supporting us. There is lots of activity on social media as well. People who aren’t even associated with the NHS are saying they support us. Despite plenty of public support, the Patients Association chief executive, Katherine Murphy, warned repeated industrial action would “continue the destruction of trust between staff and their employers, and erode the public’s confidence in the service”. Intensifying the pressure on the government, NHS staff – including junior doctors – and patients are holding a “blue light” vigil on Wednesday night outside Downing Street “to remind the government and public that the NHS is already 24/7”. Delivering a seven-day NHS is the rationale given by the the health secretary for changes to the junior doctors’ contract, including designating Saturdays as a normal working day, which would not attract overtime payments. The BMA says the changes would increase the burden on its members and thereby compromise patient safety. In parliament, Hunt was mocked for giving a statement on patient safety while failing to mention the strike. In response, Hunt accused Labour of backing the BMA against patients, who he said need a seven-day NHS. Two further 48-hour strikes are planned for next month.